“We are what we repeatedly do. Excellence, then, is not an act, but a habit.” So, it seems natural that United Yacht Sales is one of the largest and most successful yacht brokerage firms in the country. With more than 75 brokers and 100 million dollars in yearly sales, United Yacht repeatedly gets the job done and with an extremely high level of satisfaction. No other brokerage firm in New Jersey can compete with United Yacht Sale’s marketing clout. We advertise our client’s vessels in 20 national and international internet databases including Yachtworld, Boats.com and YachtCouncil. We advertise in major publications such as Yachting, Power & Motor Yacht, Big Game Journal and Marlin magazines. 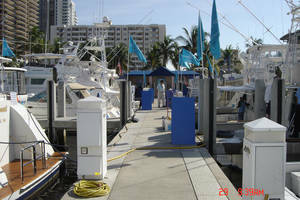 And our brokers attend every major boat show throughout the east coast. Whether moving up, moving down, or moving out, the United Yacht Sales New Jersey team is ready to serve your needs. Contact one of our professional brokers today for a no-cost evaluation of your boat. At United Yacht Sales, we all work very hard to earn our client's trust "one boat at a time". FISH NAILERis a perfect example of a well maintained and fish rigged Albemarle. Powered by C12 CATS, optional CAT warranty available. She runs a cruise of 30kts. A beautiful teak finished interior and the best of electronics including the tower helm.